I confess: I’m biased. I love wine – almost as much as I love craft brews. I get hung up on Californian wines; they are awesome and grow in my back yard, so to speak. Actually, I love drinking wine, not keeping it in a refrigerated vault as an asset class. So I don’t get the gut-wrenching feeling that investors get who didn’t sell in time and then ride out the implosion of a bubble. And their guts are being wrenched. Blame China and central banks. Wine as an asset class became airborne during the pre-Olympics China bubble when rich Chinese began plowing their money into it. From the summer of 2005 through the Beijing Olympics in 2008, the Liv-ex Fine Wine 100 index – the “fine wine industry’s leading benchmark” – skyrocketed 152%. But in the four months after the Lehman Moment, the index plunged 22%. Frazzled by the seizing wine market, the Fed and other besotted central banks began to douse certain layers of the world with free money so that Chinese wine buyers would re-indulge in the game. It worked. By July 2011, the index had soared 76% to 365. The peak of the wine bubble. Then all heck broke lose. The monthly Liv-ex Fine Wine 100 is based on “100 of the most sought-after fine wines for which there is a strong secondary market,” mostly Bordeaux, “a reflection of the overall market,” along with some wines from Burgundy, the Rhone, Champagne, and Italy (list). And these are, or were, precisely the high-profile brands that Chinese investors, many of whom didn’t even drink wine, had the hots for. So in May, the index dropped another 1.4% to 243, down 33.4% from its peak. It’s back where it was in June 2007. 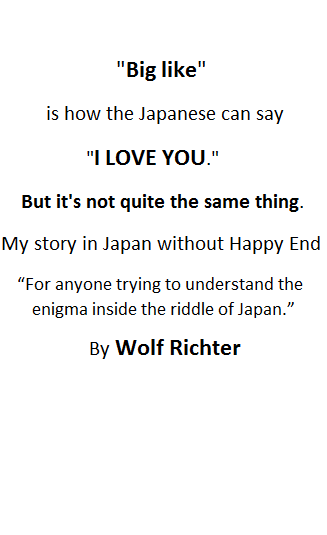 And even at that level, it seems to be supported only by thin mountain air. 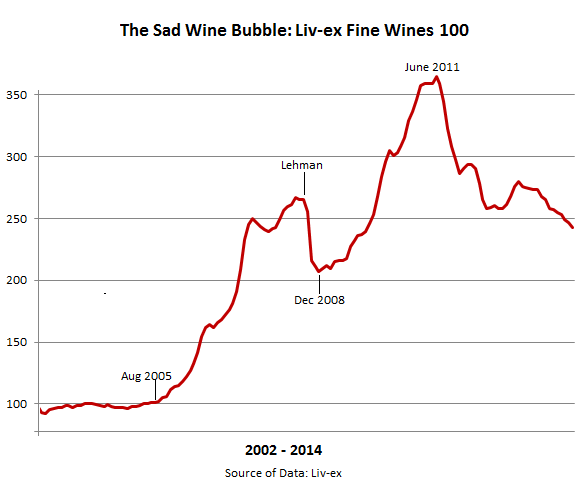 The Liv-ex Fine Wine 50 index of the “most heavily traded commodities in the fine wine market,” as Liv-ex calls them – the last 10 physical vintages of the Bordeaux First Growths, Haut Brion, Lafite Rothschild, Latour, Margaux, and Mouton Rothschild – soared and then plunged even more. My data from Liv-ex only goes back to February 2010, when the wine bubble had already done most of the blooming. From there, it soared another 63.4% to 446 on July 28, 2011. As I’m writing this, on June 2, it closed at 274, down 38.6% from its peak. A relentless three-year gut-wrench. Investors should have been drinking their investments instead. But in China, that’s exactly what they fear the most. Not only because it would destroy their investment, but also because that’s when they’d find out that their cherished but plunging investment stored in their refrigerated vault might be counterfeit. “A big and lucrative business in China,” writes Ray Jordan, Wine Editor, at The West Australian. Methods range from refilling empty bottles of famous Bordeaux to sticking fake labels on cheap bottles of Chinese wines. And they’re getting more sophisticated. China’s CTV reported that 50% of all wine sold in China might be fake. But “many in the industry” believe, Jordan noted, that for the “high-profile brands, such as Bordeaux’s Chateau Latour and Chateau Laffite,” it’s more like 90%. A devastating thought for investors who keep their wines locked up rather than drink them. Hence the crash of Bordeaux. When confidence hisses out of a bubble, it collapses. But it’s not all doom and gloom. The Liv-ex Fine Wine 1000, the broadest measure of the market that tracks 1,000 wines from across the world, edged down in May by 0.7% to 245.7, a level it had first seen in December 2010 on the way to its peak of 280 in July 2011. Since then, it declined “only” 12.5%, dragged down by its Bordeaux sub-indices. But some of the other sub-indices rose. And over the last two years, the “Rest of the World 50” sub-index – where you’ll find American wines – jumped 16.5%. “The USA has led the charge,” Liv-ex wrote on its blog in February. “Dominus 2005 and 2006 have risen over 40% since January 2011,” though “they are still relatively affordable” compared to Bordeaux First Growth wines. “Recent vintages of Opus One have also risen in price, perhaps boosted by the attention from the release last year of the 2010 – winemaker Michael Silacci’s self-proclaimed ‘best vintage yet.’” They’re all California names. So is there another wine bubble in the making, but this time in California? Production has been booming for years, and prices have been on a tear. A wine bubble with medium acidity would nicely complement the other bubbles already blossoming into maturity in our boom-and-bust state, such as housing, fracking, farmland (now parched), and the stocks of social media, cloud, ad technology, and biotech companies…. Oops, forget that too. They’re already crashing. Waited too long.